The proposal was put forward by the Dutch Labour party, PvdA, in March and received a majority vote in the Tweede Kamer, the lower house of parliament, backed by the country’s green-focused political parties. It suggests gradually putting legislation in place to prepare for a ban on new vehicle sales with petrol or diesel engines over the next ten years, as well as replacing fuel stations with a network of fast chargers to support electric vehicles. The eventual aim is to phase out fossil fuel-powered vehicles by 2030. The PvdA said the Netherlands is perfect for electric vehicle adoption, as it’s small and flat and possible to drive from one side to the other on a single charge, adding that lithium-ion prices are continuing to fall. It also wants to close coal power plants by the end of 2025, moving to wind energy and on-shore storage, the proposals outlining how cars spend 23 hours per day parked. 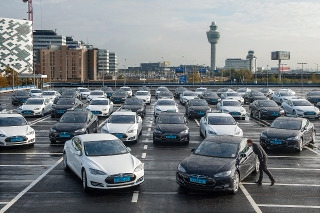 The Netherlands is already one of Europe’s largest markets for electric vehicles. Sales were helped last year by the final months of company car tax advantages, but it overtook Norway to become the region’s biggest market by volume with 43,441 plug-ins registered according to ACEA figures.